We continue to hold Community Environmental Briefings across Japan. As one way to communicate environmental risks in the context of the Japanese PRTR (Pollutant Release and Transfer Register) system, each year since fiscal year 2002, we have held Community Environmental Briefings. In fiscal 2007, we also organized a new briefing at our Osakasayama Site, in addition to the regular briefings at our Tokyo Site, Itami Site, and Mizuho Site (the Mizuho briefing covered three sites in the Tokai region). Konica Minolta places importance on holding informal gatherings after the briefings to answer questions from participants. The residents offered their opinions and asked questions about community concerns on a variety of subjects including initiatives to cut CO2 emissions to combat global warming and other environmental issues such as waste reduction, as well as initiatives for traffic safety. It was a great opportunity for us to understand the deep concerns about the community and high expectations local residents have for Konica Minolta. In the future, we will continue to promote good communication with local residents in order to foster trust and confidence in our communities. We also provide site tours to local residents and visitors from schools, governments, and other companies, both in and outside Japan. The Tokyo Site held Konica Minolta's first Community Environmental Briefing in 2002, and the fiscal 2007 event marked the sixth one. After an opening message from the representative of the Tokyo Site, the briefing covered current site conditions including environmental initiatives as well as safety and disaster prevention and community involvement efforts, based on the Konica Minolta Tokyo Site Environment and Safety Report 2007. Afterwards, local residents were taken on a tour of the site, which provided them with an opportunity to get an up-close look at the environmental equipment that is not normally seen by the public. At the informal gathering that followed, local residents expressed opinions such as these: "I am convinced that Konica Minolta is taking the proper steps to help fight global warming; I think I'll tell others about this," and "I'd like to take this opportunity to urge local residents to move forward in the fight against global warming together." The residents and the company also agreed to work together on the "Team Minus 6%" campaign promoted by the Japanese government. The Mizuho Site began holding its annual briefing in fiscal 2005. There were 32 participants in attendance at the fiscal 2007 briefing, a fourfold increase compared to the first time, three years prior. Since there are three Konica Minolta sites in the Tokai region, the briefing was held jointly this time, at the Mizuho Site. The participants included representatives from the local chamber of commerce as well as city and prefectural governments. All of these representatives showed a great deal of interest in Konica Minolta's environmental and social initiatives. The briefing covered current site conditions including environmental initiatives as well as safety and disaster prevention and community involvement, based on the Konica Minolta Tokai Region Environment and Social Report 2007. Afterwards, participants were taken on a tour of the site, where they inspected the environmental equipment, as well as the development and design workplaces. At the informal gathering that followed, residents expressed opinions such as, "I am impressed that the company is actively carrying out the sorting of waste materials." This was the third annual briefing since the first one in fiscal 2005. After reviewing production items and environmental posters in the display area, the participants listened to a report on the site's environmental initiatives. During the tour of the site, the visitors saw the site's environmental equipment, a survey spot for groundwater boring, and a location where soil decontamination is being carried out. The participants were also told about the site's soil decontamination project. In the question and answer session that followed, local residents and Konica Minolta representatives had a lively dialogue. This year marked the first briefing for this site. After an opening message from the representative of the Osakasayama Site, the briefing covered current site conditions including environmental initiatives, safety and disaster prevention, and community involvement efforts. Afterwards, the participants were given a tour of the site, and at the new building on the premises, they were given a chance to go inside and shown the unique environmental design features. Local residents offered the following feedback: "I was able to experience the motion-sensor controlled lighting and the energy-saving design of the stairway emergency lights," and "The lighting in the sunlight well gave it a bright and spacious feeling." During the question and answer session at the end, the participants asked questions and gave their opinions on a variety of issues such as efforts to add greenery to the site and ensure traffic safety at the main gate. Here are some opinions that were expressed: "It is clear that Konica Minolta is actively working to promote good communication with the community; I look forward to future briefings like this one," and "I was worried that the increase in employees at the site would raise the volume of traffic, but I feel better after hearing about the company's traffic safety measures." Residents and the company agreed to keep working together for the benefit of the community. Konica Minolta was recognized for activities to promote community dialogue and communication about environmental risks. On July 4, 2007, Konica Minolta received the 1st Responsible Care Award from the Japan Responsible Care Council (JRCC) of the Japan Chemical Industry Association for its efforts to practice and promote community dialogue and environmental risk communication. In light of global environmental issues and the new problems posed by factors such as increasing industrialization and technological advancement, today, more than ever, producers of chemical-related products need to take responsibility for environmental conservation, safety, and health. Given this situation, the Responsible Care Awards were established as a new system to recognize individuals and groups that contribute to the promotion and improvement of responsible care activities. The recent award was given in recognition of Konica Minolta's responsible care efforts. We were quick to carry out communication about environmental risks with plant neighbors starting in 2002, and continued to hold communication meetings since that time. Based on these actual experiences, Konica Minolta has given case presentations on many occasions, including case reporting sessions hosted by the Tokyo Metropolitan Government, and even provides information to regional organizations, companies, the National Institute of Technology and Evaluation (NITE), and the Center for Environmental Information Science. The award also recognized Konica Minolta for these efforts to implement and promote communication about environmental risks. Moreover, since the award was created to honor people rendering distinguished service in this field, it was presented to Yoko Kita, who is in charge of environmental risk communication at Konica Minolta, and who made remarkable contributions by actively promoting responsible care activities through dialogue with schools and community groups. Responsible care activities: Each producer of chemical substances voluntarily ensures environmental conservation, safety, and health, in all processes from the development of chemical substances to their production, distribution, use, and disposal after final consumption. The producers also must announce the results of their activities, and promote dialogue and communication with society. These activities are called "responsible care." We are working to promote environmental education in society through various communication channels. In order to build sustainable societies, it is important to raise environmental awareness and understanding within society as a whole. This is why Konica Minolta is working to promote environmental education, not just among its employees, but also for the entire public, in order to make everyone aware of the need to protect the environment. On December 20, 2007, Masugata Junior High School in Kawasaki, Kanagawa, held an open house for Energy and Environment Education. A Konica Minolta employee gave a lecture entitled, "Reuse and Recycle: Caring for the Planet." The Energy and Environment Education program began in 2003 with support from the Energy Conservation Center Japan, by establishing Masugata Junior High School as a model for promoting education on energy conservation. After that, the school was designated as a school for energy education by the Information Center for Energy and Environment Education. Based on a consistent policy since the beginning which calls for environmental education that considers both the global environment and individual lifestyles, the school has been promoting environmental education that always includes practical applications. As a result of this program, the school has greatly reduced its electrical usage, and the students have also helped to save electricity in their own homes. In recognition of these results, the school has received numerous awards including the Environment Minister's Award for Activities to Help Prevent Global Warming in 2005. During the open house on Thursday December 20, 2007, the student body was divided into 11 groups, with workshops in the morning and forums in the afternoon. The guest instructors from different companies played a leading role, and teachers from the host school also provided assistance. Lecture by Konica Minolta: "Reuse and Recycle: Caring for the Planet"
Konica Minolta has been giving classes as one of the cooperating companies for this event since 2004. For 2007, the lecture was entitled, "Reuse and Recycle: Caring for the Planet." During the morning workshop, the students learned the difference between reusing and recycling parts through the manufacture of clay models. They also learned the importance of not wasting energy and other environmental considerations. After the workshop, students offered their impressions: "I learned that it is better to reuse than to recycle," and "Now I know how difficult it is to recycle things." During the afternoon forum, the students gave presentations on what they could do in their own lives in order to reuse and recycle. Through the presentations, they once again recognized the importance of reusing things, with ideas such as refilling bottles for products like shampoo, and buying from flea markets. Konica Minolta communicates with residents, NGOs, and local communities about environmental conservation. Through various activities, Konica Minolta is strengthening ties with its stakeholders, and working toward the creation of a society with an even brighter future. We intend to actively fulfill our responsibilities as a corporate citizen, and to remain a welcome member of the communities in which we operate. Not long ago, the number of red-crowned cranes* indigenous to Japan plummeted due to the deterioration of their native habitat. The bird was, for a time, on the verge of extinction. However, thanks to the establishment of the Tsurui Ito Red-Crowned Crane Sanctuary in 1987 by the Wild Bird Society of Japan, and to the protection activities undertaken by local residents and concerned organizations, the number of cranes has increased to more than 1,000. Konica Minolta has been a supporter of the sanctuary for 20 years, ever since its establishment. We provide support for its crane protection activities, namely conservation of the crane habitat, research on their behavior, and personnel training and educational activities. The red-crowned crane is a large bird with a white body and a patch of red on the crown of its head. Its habitat extends from eastern Eurasia to Hokkaido in Japan. Every year, we support the Konica Minolta Red-Crowned Crane Charity Photo Contest held by the Wild Bird Society of Japan. In 2007, a set of five postcards was again produced using the prize-winning photos to commemorate the charity. In order to support conservation activities for this bird, the postcard sets were given as gifts to everyone who donated 1,000 to the Tsurui Ito Red-Crowned Crane Sanctuary. The year 2007 marked the 20th anniversary of the establishment of the Tsurui Ito Red-Crowned Crane Sanctuary. Consequently, we created a photo collection from the prize-winning pieces received for the photo contest over the years, and used them for a commemorative charity program. Thirty photos were chosen from all the winning contest entries to date, and a photo collection was produced using high-resolution on-demand printing* with the bizhub PRO C series. This series of high-speed color MFPs was designed for the convenience-printing field where Konica Minolta is concentrating its efforts. 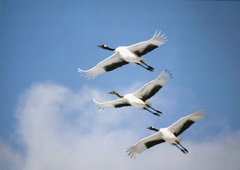 The photo collections were given as gifts to everyone who donated 1,000 to the Tsurui Ito Red-Crowned Crane Sanctuary. On-demand printing allows users to print out just the required number of copies, whenever needed. On-demand printing using an MFP eliminates the need for printing production work, thereby offering rapid low-cost printing. 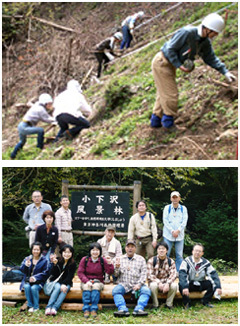 Konica Minolta participates in and supports various forest conservation activities. The Takao Forest Society manages the natural vegetation of a national forest, located in the western part of the Tokyo region. The society aims, by thinning and planting trees while clearing the undergrowth, to restore a lush forest where coniferous trees are interspersed with broad-leafed varieties. With Konica Minolta as a corporate member, and employees as individual members of this organization, we are rolling up our sleeves every month to promote forest conservation. 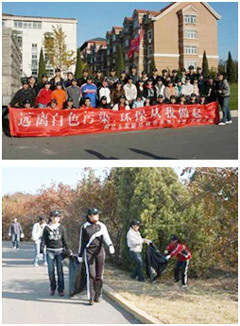 On November 3, 2007, some 200 employees of Konica Minolta Opto (Dalian) Co., Ltd., and their families participated in a cleanup at Paotaishan Park in the Dalian Economic and Technological Development Zone. In China, the profusion of litter, including plastic shopping bags, has become a social issue. Under the slogan "community environmental protection begins with you," the employees got together to collect rubbish in the park, and filled 30 garbage bags, each with a 90-liter capacity. Many employees participated in the activity with an awareness of the need not just for park cleanup, but also for environmental protection. Many children of employees also volunteered to participate in the event. Providing children with an opportunity to develop awareness for environmental conservation is not only good for the children, but can become a great asset for the entire community. 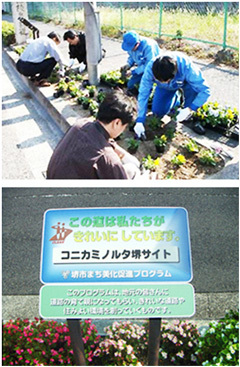 The Konica Minolta Sakai Site has been participating in Osaka Prefecture's Adopt-a-Road Program since 2002. Employees carry out beautification activities along a road near the site by creating and maintaining flowerbeds. On November 14, 2007, the flowerbeds were replanted along the bus route in front of the site. The replanting, watering, and weeding of the flowerbeds is carried out by all seven Konica Minolta companies with premises on the Sakai Site, and they are helping to keep the neighborhood looking good. As the name suggests, this program encourages companies to "adopt" a section of road, and take care of ongoing cleanup and planting along the sides of that roadway. Originating in the US in the mid-1980s, Osaka prefecture decided to take on the idea, and is promoting the program through government and community partnerships.